The humpback whale was struck by a ship and killed recently, according to authorities. Now the Makah Nation is butchering the animal and preparing a feast. The death of a 31-foot humpback whale killed by a ship that broke the whale’s jaw and fractured its skull has turned into a celebration at Neah Bay, where the whale is being butchered for a feast. The tiny tribe at the farthest Northwest corner of the continental U.S. has a reserved treaty right to whale. The Makah people have throughout their history also harvested stranded whales such as this one, as well as taking to the sea to hunt whales by harpoon from canoes. But the tribe hasn’t hunted for years as it has been at work in the courts and with regulators to one day conduct another legal hunt. 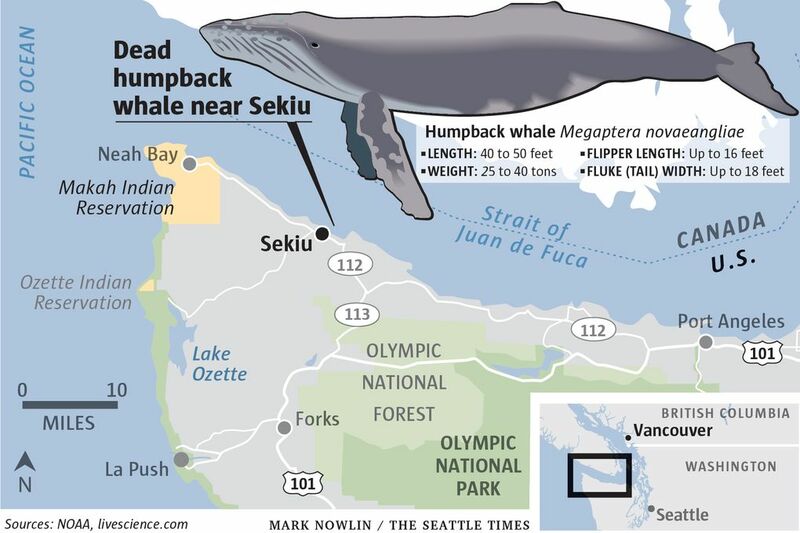 The humpback was first discovered Thursday morning by tribal fisherman in the Strait of Juan de Fuca, near Sekiu, Clallam County. Tribal members first reported the find to the tribal biologist at Neah Bay about 9 a.m. The biologist reported the finding to the federal whale stranding network, which dispatched a biologist with the Cascadia Research Collective to Neah Bay. 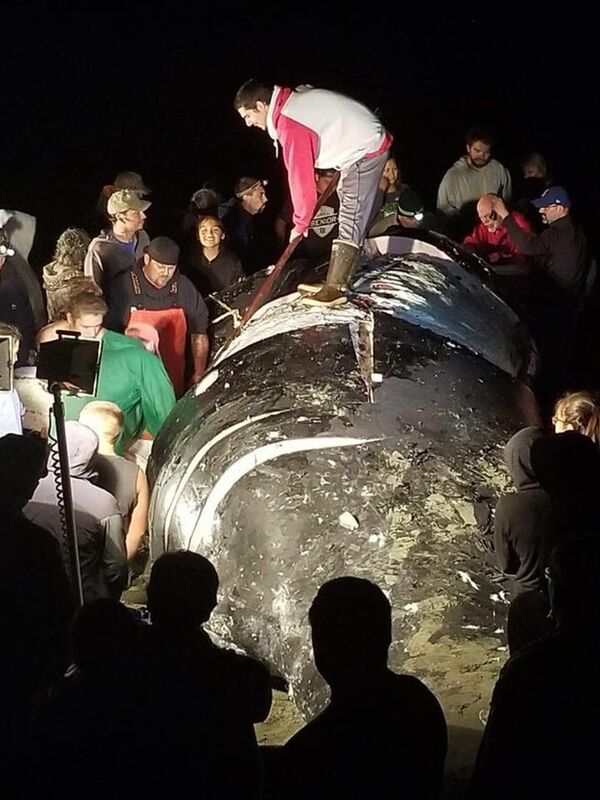 After an initial assessment by the tribal biologist that confirmed the cause of death while still on scene with the whale, the fishermen and tribal biologist began towing the whale west in the Strait of Juan de Fuca to the beach at Neah Bay. The tribe, assisted by the Cascadia Research biologist, performed a necropsy on the beach. News of the whale quickly spread throughout the community Thursday and tribal members began gathering on the beach, to be ready to greet the whale on the beach in the heart of the village. As soon as the whale was brought home, tribal members blessed the whale with a sprinkling of eagle down, song and prayer, Tyler said. After scientists contacted by the tribe took samples for analysis, tribal members began butchering it, work that continued through the night. The gift of the whale came one day before Makah Days, the tribe’s annual community feast and festival, and now will feed the whole village. The juvenile male humpback was likely feeding when it was struck and killed by a ship, said Michael Milstein, spokesman for the National Oceanic and Atmospheric Administration. The whale is a blessing in a community that has not been able to legally harvest a whale for years, Tyler said. The Makah Tribe conducted its first whale hunt in 70 years in 1999, bringing a gray whale to the same beach. Feasting went on for days and the tribe celebrated a revival of a part of its culture that had been dormant for years. Gray whale populations are healthy, and the tribe worked with federal partners to create a permit and regulatory system for the hunt. That whale was harvested from a canoe by tribal members using a high-powered rifle, to ensure that the animal would have a swift and humane death. Humpbacks are enjoying a resurgence in population under the protection against commercial whaling.